A maize plant attacked by the fall armyworm. 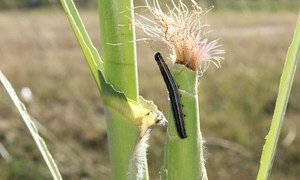 “Fall Armyworm could have a devastating impact on Asia's maize and rice producers - mostly small-scale farmers who depend on their crops for food and to make a living,” said Kundhavi Kadiresan, FAO Assistant Director-General and Regional Representative for Asia and the Pacific. Hans Dreyer, Director of FAO's Plant Production and Protection Division, believes action taken in Africa can also benefit Asia. 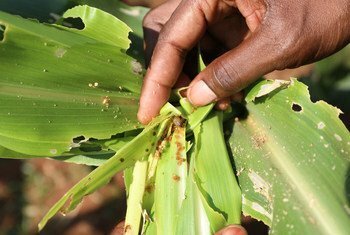 "Much of what FAO has already done in sub-Saharan Africa to help farmers and governments better monitor and mitigate Fall Armyworm damage, can also be applied in Asia,” he said.